We are all about helping authors find more readers but this past week we saw a segment on the news that just broke my heart. Anna started a free little library and someone stole it. As I was watching the news I knew we had to do something. She eventually got her library back after someone saw it on Craigslist but by that time she already had another one donated. That library is being given to someone else and will help kids in another neighborhood. Last Saturday they had a grand reopening so I went and with the help of Debbie from BookGoodies we donated a bunch of books, bookmarks and even some tote bags so they have a way of carrying the books. When I went and saw kids going through the books as if it was Christmas morning it left a great feeling. Here is a little video I took when it was almost over. There were hundreds of people there during the day and this was taken as it was winding down. I encourage you to find a Little Free Library near you and go donate a book or two. Are The Gate Keepers Running Scared? What happens when your agent is now your ex husband and your publisher decides to put you out to pasture? You go indie! New York Times best selling author Eileen Goudge has written 32 novels, sold over a million copies, and been translated into 22 languages. What she doesn’t have is a book deal. To me this is a classic example of the “Big publishers” worrying about how to survive in the new self-indie world. Read this guest post on Anne R. Allens blog it is a wake up call for established authors who think they can’t be replaced. Great article on what can happen to even a best selling author. There is some lessons to be learned here. If Eileen had started her own email list years ago she would have raving fans and sales every time she released a new book. She wouldn’t of needed an agent, a publisher and all that other stuff they promise you. Like the article says she has a good editor and puts out good stuff. I am sure she will land on her feet in no time. If I was in Eileen’s situation I would have my email newsletter sign up on the top of all her pages on her site and blog more than once every 2 or 3 months. Jim and Bryan talk about Bryan’s recent success with selling books on Kobo. Their news of the week also has some good tidbits. We asked some of the brightest stars in the self-publishing firmament if indie authors can still make money by giving away books. This article is a few months old but still has some good information for authors. In my early twenties, I turned to those big, landmark books: Doris Lessing’s The Golden Notebook, D H Lawrence’s Women in Love, Pasternak’s Dr Zhivago. My reading became increasingly eclectic as I discovered Marguerite Duras, Milan Kundera, later Kazuo Ishiguro and Haruki Murakami. But over the past few years I’ve rediscovered the child in me that loves a mystery. I’ve read all the books by Nicci French. All Patrick McGrath’s. Stieg Larson’s trilogy, and Jo Nesbo’s series featuring Harry Hole. Recently, all three books by Gillian Flynn, and lots of psychological thrillers such as Samantha Hayes’ Until You’re Mine. I’m also a lover of ‘film noir’. Harry Potter film earned more than $974 Million in the worldwide box office and have been nominated for several awards including the Academy Awards for Best Costume Design, Best Original Score and Best Art Director. As well known this movie has been based on the novel written by J.K. Rowling. The cast Daniel Radcliffe, Emma Watson, and Rupert Grint has been instant stars after appearing in the said movie for almost thirteen years ago. The Notebook is also one successful novel that was made into a movie. This is a romantic drama film that was released in 2004. This movie is been based on the novel written by Nicholas Sparks who also wrote A Walk to Remember, Message in the Bottle, and Nights in Rodanthe that were also smoothly translated to big screen. This movie talks about a rich girl who fell in love to a working-class boy during summer and was threatened to fall apart. The Actors of this movie Ryan Gosling and Rachel McAdams played successfully the teeming with tangible chemistry. Twilight is a successful romantic fantasy movie that was released in 2008 and grossed over $392 Million worldwide. They were also chosen as the most purchased DVD of the year. This movie is based on Stephanie Meyer’s novel of the same name followed by the next novels in the series New Moon and Eclipse. The story captures all movie goers where it talks about a handsome vampire who fell in love with the girl next door; it is almost ethereal love story. This movie has been one of the most talked about movies in a long time. Also Robert Pattinson and Kristen Stewart made on screen romance into real life romance which really added to the illusion of the movie fans. Hunger Games has won the audiences since the Twilight time not only because of the gripping story line but also to the gorgeous casts of the movie. This American adventure film was released last 2012 who directed by Gary Ross. This movie was based on the novel of the same name by Suzanne Collins. Jennifer Lawrence is the star of this movie as the heroine Katniss Everdeen, Josh Hutcherson as Peeta Mellark and of course the hunky Liam Hemsworth as Gale Hawthorne. The Hobbit is the first of three fantasy adventure films that was based on J.R.R. Tolkien 1937 novel. This was released in 2012 followed by The Desolation of Smaug (2013) and The Battle of the Five Armies (2014). This story was set in the middle-earth sixty years before the events of The Lord of the Rings. This was directed by Peter Jackson. With the outstanding visual effects, production and makeup design snagged the film three Academy Award nominations. More than that, Orlando Bloom joins Martin Freeman and Benedict Cumberbatch for the second installment. There is no need to wait for too long since The Hobbit: There and Back Again is set to be released in 2014. Do you agree with these choices? Do you have a better one? Leave your thoughts in the comments. Yesterday while walking around the Tucson Festival of books I was asked a lot of questions by authors about social media. When I told them that their book would be spread across our social media channels by submitting to our site they asked me if it was free to submit a book why would I pay for the $10 promo. I told them that our social media doesn’t blast out every book we get submitted to us. It is random but the paid promo goes out at least once and sometimes if it is a slow day we will push it out twice. Today was a slow day and a book that was featured was called “For the Love of Ireland by Judy Leslie”. We sent it out in our social media stream and it seemed to take on a life of it’s own. It went out at 140 in the morning I think it is EST for those asking. It was RT’d by Lorraine Pestell who has over 2200 followers. So between our 4900 followers and Lorraines the Tweet was in 7100 peoples eyes. Not so bad. Here is two screen shots showing the amount of followers each one of them had. I could only fit 5 authors in each screenshot as the Twitter window didn’t let me scroll. Those 10 Re-tweeters have a combined following of 189,570 plus Joans 14,500 = 204,070. Now I didn’t go though how many rt’s each one of those people had but I am sure out of all those followers someone had to have some serious RT action. What should also be mentioned is these Twitter accounts are mostly other authors or readers that have this following so it is kind of targeted in the reading niche. Did I mention that this only cost $10 and it is the bonus on top of the 3500 people that get the email the book featured? I haven’t even mentioned the Facebook and G+ social accounts! Now I can’t say this will happen with every book but I am pretty sure our reach is very good. Much better that having a Twitter tweeting service that isn’t targeted. We just got back from Tucson Arizona where Debbie from BookGoodies.com and I attended the Tucson Festival of Books. We had a great time and was amazed at how many people were there. We spoke to a lot of authors while we were baking in the sun. It was a beautiful day to be out and finding new authors while we explained how we promote books for free and offer free interviews for authors. As we went from booth to booth one question we kept getting asked was how much do we charge? When the authors found out that they can submit their books to our site and fill out a free author interview they were amazed. It was good to see a few authors that have used our service. One author told me they had sold quite a few books because of our free interview service. That is always nice to hear. The people working the festival were very nice and helped me a few times with directions and where to find an ATM so I could get cash out for one of the many food vendors that were there. I loved the BBQ I had at Brushfire BBQ. I won’t admit how many I had but it was more that 3. This year they were expecting over 100,000 people at the festival and I am sure the number was higher than that. There were authors from all over the United States and I was happy to have a conversation with Sid Brodkin about Brooklyn NY and the memoir he wrote about growing up in Brooklyn and Las Vegas. It was nice to see someone from close to home all the way out here in Arizona. They had a little circus/carnival for the kids with jugglers and other book readings by famous authors. They had something for everyone there. The Science exhibit section was very well attended and the kids seem to be having the time of their life doing things like launching plastic bottles using just air and muscle. It was fun to watch the kids having so much fun. We found out about the festival only a week or so ago so we didn’t have time to get a booth. Odds are we will have one next year for Awesomegang and the Author Ad Network. Looking forward to spending the whole weekend in Tucson next year instead of just one day. To see more about the festival visit the Tucson Festival of Books or follow us on Twitter. You can see more pictures in our AwesomeGang Authors Facebook Group. 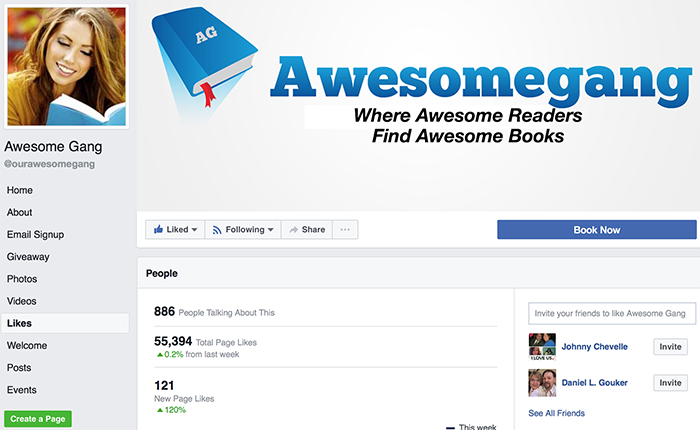 Awesomegang has joined forces with Bookgoodies and the Author Marketing Club to create a network of sites where you can advertise your book for a package price. The package gets you a 2 day front page feature on 8 websites – 9 if you write romance or erotica. You pay one price and fill out one form and boom your book will go on all the sites in the network on the day you specify, or the next closest available day. Click on the image to get started. Your book also will be featured on these sites by genre. So only Children and Young Adult books will be featured on BookGoodiesKids, Mystery Books on MysteryReads etc. You will pick the genre for your book when you fill out your book submission form after payment. This doesn’t replace our regular advertising, the ad available in the network is a separate ad that includes a lot more exposure. We hope you like this concept and look forward to your participation! Broad Channel NY 8/20/2013 – Awesomegang.com one of the leaders in eBook promotion just welcomed it’s 1000th member into its Facebook group of authors. This is coming on the heals of its latest milestone of reaching 10,000 books published to the site which happened on July 15th. Awesomegang was started by serial internet marketer Vinny O’Hare http://vinnyohare.com after his release of his first eBook Cadillac Pictures Volume 1 (http://www.cadillaccountryclub.com/blog/cadillac-pictures-for-sale-on-kindle/) was not selling after the book was launched. He quickly learned that most authors didn’t know how to market their book. He took a look at promotion methods and felt the need to help other authors that were going through the same process of marketing. I often get asked what do you get by paying for advertising your book on Awesomegang. Here is a list of benefits that you get. Featured Listing – Our Featured Listing promotion cost is $10 for each book. You will see the option for this on the bottom of the Submit Your Book page. We want to help as many authors as possible and we know Indy authors have a limited budget. Our book promotion guarantees that your book will be listed on our site. Besides the 2 day Featured Listing mentioned above you also get put in our newsletters which are mailed daily to readers looking for books. As a bonus we send out links to your books on our social media accounts. We guarantee it once a day but it is usually twice a day unless we get a lot of book submissions. The number of followers and fans change daily but here is our latest update. Facebook Fan Page – Ourawesomegang has 55,394 Facebook fans as of February 2017. It has become very popular with the crowd who are looking for eBooks that are free or deeply discounted. Twitter Account – @ourawesomegang As of February 2017 we have about 16,273 followers. That number increases daily so by the time you read this it will be more. We have been added to peoples Twitter list 698 times. We must be doing something right. Google+ page has 969 followers that follow our latest books as of February 2017. There are other services out there that promise you the moon and say they have a million readers. We could do that also but that just isn’t right. We look out for our authors here. Still on the fence? Visit our testimonials page and see what others have said about our site. Get Started Using Our Featured Option Here! Here is a short video put together by KDP and Createspace showing highlights from Book Expo America. I am sorry I missed it. I have gone to BEA for the past few years but this year my schedule didn’t permit it. If you are an author and you wanted to try our featured homepage listing we have a contest for you. This contest is for 3 featured homepage listings. There will be 3 winners drawn each for one feature listing. A featured listing consist of having your book featured on our homepage for 3 days. It will also go out in our social media channels, Facebook, Twitter, and G+. Your book will also get go into our newsletter. You can use the Tweet everyday for more entries! Good luck. Do you own a Kindle? If so, then you may not know this, but you can actually get free Kindle books. There are plenty of places where you can get free Kindle books, but you should know what the best places are. If you want to find out where the best places to find free Kindle books from, then I suggest you look over our list of favorite places. They are in no particular order. You may find one better than the other for your liking. The first site I always check is the Author Marketing club. This site is great as you can easily search through the genre for the type of books you are looking to read. I highly suggest signing up for the daily email. You get free books delivered right to your inbox. Click here to go to the Author Marketing Club. Great list of free eBooks that is updated daily. You can find many of the top author listed here. Another site that you may want to subscribe to their email newsletter. How can you go wrong with a site with both Books and Goodies in the title. Click here to go to Bookgoodies. Pixel Of Ink is also a great website that you can go to and get free books for your device. Pixel Of Ink has very large selection of books for the Kindle, and this is one of the reasons why Pixel Of Ink is one of the best sites to go to when you are trying to get free books. Pixel Of Ink may not be as popular as Amazon, nor do they have as many Kindle books available, but the site does get many new titles on a daily basis. You can subscribe to the site, and then you will receive updates on when they receive new books. Click here to go to Pixel of Ink. This is a very unique website that offers free Kindle books that you can loan. This means that you actually do not get to own the books that you get. Think of Overdrive as a public library. When you get a book from the library, then you have to return it by a due date. When you get a Kindle book from Overdrive, then the book will remain on your Kindle until a specific date. Once the “due date” arrives, the book will automatically be removed from your Kindle. Don’t worry though because most of the books you get from Overdrive, you get to keep for a few weeks, which means that you will have plenty of time to read it. It is worth noting that your public library will need to have a subscription to Overdrive, but many libraries do, so the chances are you will be able to use the website with no problems at all. Click here to go to Overdrive. If you cannot use OverDrive, then you will be able to use BookLending. This particular website is also a unique site that allows you to obtain free Kindle books. Essentially, you are borrowing and lending books on this website. There are many Kindle users who turn to BookLending when they want to get free books for their Kindle, which is great news for you. It is great news because it means that the chances are very good that you will find a book that interests you. All you need to do is register with the site, which is completely free to do, and then you will be able to lend and borrow books. Click here to go to Booklending. This is one of the best sites to get Kindle books that do not cost a thing. What makes this site slightly different than many of other sites is that it updates its free Kindle books on an hourly basis. Most sites will only update their listings once per day or just a few times per day. You can also filter results by newest titles, the amount of reviews that a book has received, how many thumbs up a book has received, author and even file size. The filtering system on eReadIQ is one of the best filtering systems, so finding a good book for the Kindle is extremely easy to do. Click here to go to eReadIQ. Just like the previously mentioned site, Hundred Zeros list of free Kindle books is updated every single hour. Thanks to the clean layout of the site, finding books is easy. The site is available to use by people located in the USA, UK, India, France, Italy and Canada too name a few of the countries that the site is available in. The search feature is basic, so all you need to do is enter a search term and see if any results show up. This site may not be the best site to use, due to the fact that only people in certain countries can use it, but if you are able to use the site, then you will love it. Click here to go to Hundred Zeros. This website is packed with many free books for the Kindle, but virtually all of the free books are non-fiction, so if you are a fan of non-fiction books, then this may be the best website to use. Whether you are looking for a book that falls into the category of business, marketing, history, health, motivation, advice or productive, then you will find it on Power Reads. The site is updated regularly, so make sure to check it on a daily basis. Click here to go to Power Reads. ManyBooks.net is perhaps the most useful website to use when you want to find free books for your Kindle device. Think of this website as a search engine, such as Google or Yahoo. Once you enter a search term into the search box, a bunch of results for free books for the Kindle will be shown to you. Basically, ManyBooks searches allover the Internet for free Kindle books. You will love how easy this site is to use, and you will also love how quick the site finds free Kindle books. Click here to go to Manybooks. Feel free to share this list with your friends and let them know how they can get free eBooks.